Although a few days here and there remind us of summer or frighten us of what's in store for winter, it is safe to say that Autumn is officially here. Winter, BLAH! Aside for all the remarkable holidays, and the first white snow of the year, I can do without it (or maybe that's what I say, although I have no plans of retiring to Florida anytime yet). I must admit, winter allows me to indulge in two of my favorite culinary techniques: braising and roasting. Both phenomenal for their simplicity and heartiness they offer. Instantly ossco bucco, ox tails, short ribs, roasted chicken come to mind, all which make my mouth water! But simultaneously it saddens me to say goodbye to lighter foods, fresh fruits and wonderful summer fruits and veggies that we had available just weeks ago. This sudden emotion is what made me want to look at the bright side and begin to think of the wonderful crops that await us even with summer behind us. So I googled fruits and veggies currently in season and found this site: http://thisfoodthing.com/index.php/2007/11/06/fruits-and-vegetables-in-season/. While it may be easier to just take a stroll through the farmer's market--which I love to do, and highly suggest, I wanted to see something in writing that would lift my spirits. So please take a look at the site and allow it to inspire you! I especially love that it's divided into months, so it serves as a calendar if you will of all the bounty that awaits us now and in the few months that follow like spinach, apples, sweet potatoes, tangelos, winter squash and more! So I guess there is no time for allowing the colder months to put me in a slump as there is so much to indulge in and create! Plus, before we know it we will be biting into the fresh pineapples of May! Join City Harvest and A Pinch of Salt today to help fight hunger in New York City with a donation of $5, $10, $15 or more. Remember every quarter donated helps delivery a pound of food to someone hungry. More importantly, hunger cannot be seen...it can be the person you least expect. This weekend I celebrated a milestone birthday, as a gift my mother-in-law took me to Le Bernardin. Yes, the same restaurant where I completed my externship. By far the experience I had was magical and unlike anything I ever experienced before, and yes I have been to some pretty nice places in my day. Upon walking in to Le Bernardin I felt extremely excited. Here I was pretty dressed up, or a far cry from the black and white checkered pants, chef coat and designer scarf tying up all my hair that I wore in the kitchen. I wondered if anyone would notice me. We got seated and as I took a look around the room I easily remembered certain waiters and Ah Ha! one finally recognized me!!! We were escorted to our table--a very nice spot in the corner and we were given the wine menu and then the chef's menu was explained. Shortly after we all placed our orders--I tried to contain myself as I was psyched about how each plate will taste. I knew they would be fantastic, but never imagined how much so. All guests are greeted with a canape as a "thanks for joining us." Tonight it was shrimp in an asparagus soup. Delicious, about 15 minutes in and already a delicious start! We picked our bread for dinner and patiently awaited our orders. Long story short, the dishes started rolling out. Each one presented new flavors that excited our taste buds and our stomachs! We ordered the Tuna app, me the Oysters over shaved ice. We ordered our the Sea Urchin Risotto, the Crab and me the Langoustine. We ordered our entrees, the Salmon, the Monkfish and me the Surf and Turf. Prior to this we all received a Red Snapper entree "compliments of the Chef". The wait staff presented each dish with a description of what was plated in front of us, and also explained how to eat them so that you tasted the dish at it was designed to taste. Then of course on to dessert. The Chef gave us each a beautiful egg laced with creamy decadent chocolate on the bottom a layer of sea salt--truly a masterpiece! Unable to decide between the Pear and the Hazelnut dessert, the waiter brought out both "from the boys inside!" Needless to say, we feasted that evening and enjoyed every bite. As we drank, ate and talked the time slipped on by. 2 Hours later and we were getting the check. As we ate we already planned on returning and named holidays or events that we would like to celebrate here. According to all our planning I am to return 3 times within the next couple of months--guess we will see what happens. But I am keeping my fingers crossed! But at the very least, I am truly grateful that I was able to visit the restaurant. This time not as a cook or extern, but as a guest. But a very special guest whose hard work earned them a bit more respect for being able to survive such a busy and perfection driven kitchen. My role here was small, but I was rewarded as a part of the team! For all those people who worked on our dishes that night a Big Thank You and as always a job well done!!! And for Chef Chris thank you for bringing a few tears to my eyes, as I was so overwhelmed by your generosity. The food tasted magnificent and the pampering unexplainable, making the whole experience one that would last me a lifetime. And a sincere thank you for inviting me into your kitchen and a small part into the life of Le Bernardin--a treasure buried at sea indeed. This weekend was the Food Network NYC Food & Wine Festival. Alex and I decided to check out a complimentary visit to Back to the Basis at the triangle at Tribeca. Usually organic or farm fresh food can be quite expensive in comparison to items found in regular supermarkets. This NY based company is trying to change that! Back to the Basis is a farmers market intended for people at most economic scales. Offering deals like Lady Lavelle Eggs--farm fresh eggs laid by free range chickens--for $4 bucks is only the beginning! Back to the Basis "partners with farmers and local communities to sell good food at affordable prices." What's not to love!!! The market is to open a new chain of "small-format" retail stores selling food "from small and mid-size family farms and producers that is traditional, localized and 100% traceable." When can you go to check it out??? The first NY store will be available to us in a month. Stay tuned for an update! BTW, After feasting on homemade fresh, velvety autumn spice gelato at the farm we went for a stroll in the neighborhood to get a feel of other events taking place near by. That's when we noticed a very familiar face--Food Network star Guy Fieri! A very sweet way of ending such a wonderful culinary-inspired afternoon! As you may know I volunteer at City Harvest. This Halloween we are asking you to help out too! How can you help? Quite easily. While you are out collecting candies politely ask if the person would like to donate a bit of change for City Harvest. What happens with all the change you collect? Well, the boxes will be collected and A Pinch of Salt will make a deposit to City Harvest's account to help ensure that people just like you and me have a meal to eat. So not only are you helping a good cause but you are still having a blast! 2. City Harvest has 17 trucks, 3 tricycles and people on foot all working to delivering food to people who need it day and night within all 5 boroughs. 3. Approximately 11% of the population served are actually homeless. The rest are people just like you and I. 4. 260,000 people are feed weekly. 5. City Harvest feeds approximately 1 million people. Half of that are children. 6. Currently 26 million pounds of food has been collected. Since 1982, 269 million pounds of food were rescued. So please parents and fellow trick or treaters let's work together and raise some money for people who are less fortunate than us. During these times we all find ourselves cutting back on expenses, but even a small donation makes a difference! Especially for someone who doesn't know where their next meal will come from. 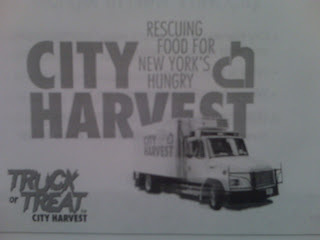 Every quarter you collect will help City Harvest rescue one pound of food for a hungry family. This Halloween let's give the treat of food. Remember a box awaits you! For more info, please email me at Raquel@apinchofsalt.com. A Happy and Safe Halloween to All! 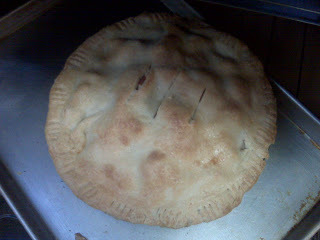 After I wrote the blog I couldn't help running into the kitchen to start my apple pie. A delicious homemade crust made in the food processor. Three cups of flour, a bit of shorting and a few tablespoons of cold butter, some ice water and there you go! I always get nervous when rolling out dough, but if you remember to give a dough a 1/4 turn inch each time you roll it will ensure a even rolling. And make sure you check the bottom to make sure it has some flour to prevent sticking. The filling--as easy as pie! 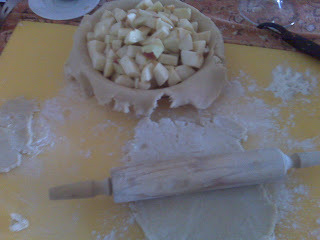 Diced apples, cinnamon, lemon zest and juice and a few tablespoons of flour. Cover with second dough and brush with egg wash and don't forget a few slits to let the steam out. Here goes the finished product! I have never been apple picking. Actually, I am not really a fan of apples, but still I have never been apple picking. This weekend that all changed! Alex, his mom and I went to Masker Orchards in Warwick, NY. And the weather was an absolutely perfect October day! When we arrived I was under the impression that it would be a bit more luxurious. I guess I imagined trees filled with a variety of apples just waiting to be picked, not to mention nice ground to walk on and apples all within arms reach. Okay, who was I kidding. Instead, we had to walk up hills and dirt paths and wander around for apples and then plan an attack on how we were going to reach them. In fact, we witnessed a couple--who were obviously masters at this--using twine to grab the apples from the very top of the tree. Either way, after a few minutes you get passed all the pitfalls and the search for apples becomes an adventure! Masker Orchards has a nice variety of apples available: McIntosh, Cortlands, Jonagolds, Mutsu to name a few. Unfortunately, a lot of these varieties were already picked by time we reached. 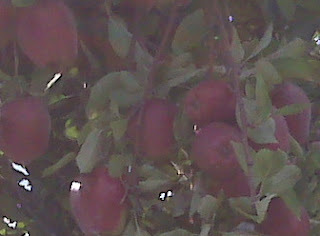 So we began filling our bag with the abundance of red delicious that surrounded us. After about an hour we were going to exit when we noticed a section with pony rides, face paintings, refreshments, and a little store to buy honey, apple butter etc. We strolled through this area and watched the children enjoy and the parents snacking on apple pie. Shortly after we left with our bag filled with apples. We paid the clerk, and then added a half gallon of apple cider to our order and on the road we went--no longer a non apple picker! However, it is now Tuesday, and I have been sending Alex to work with an apple a day and my apples haven't budged....guess I have a apple pie, apple clafouti and apple sauce in my near future!